If you like all things colorful, you're sure to love my featured artist this week. 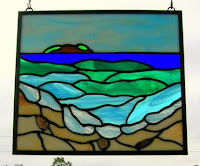 Art and Beth - Glass of Many Colors - create beautiful AND affordable stained glass pieces. They are offering an opportuinty to win a special piece from them--read on to see how. What an amazing husband and wife team...read on to get to know them and their craft a little better! Before I even answer question number one I’d like to pre-empt this interview with the statement that our business is a husband and wife team. Even though I write in the first person as Art-the husband; Beth is a full half of the team. We work our business together each doing separate tasks and duties and sometimes overlapping too! 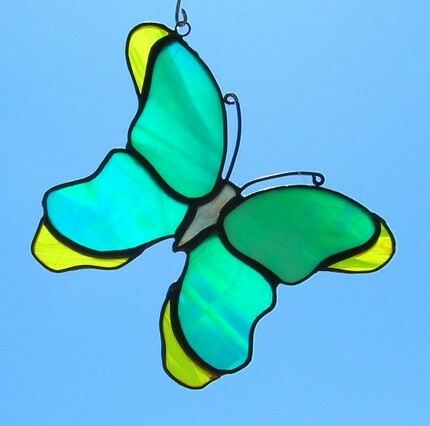 About ten years ago my Mother telephoned me and explained that she was going to flea-market her stained glass supplies and would I be interested in the lot. I said yes and two weeks later some twenty boxes and a large wooden glass rack were deposited in our garage! I had no idea my Mother did stained glass. She explained she had joined a group, put together all the needs buying from here, there, new, used, and everywhere and then the group had folded. Well she was joining for the social aspect anyway so it never went anywhere. The boxes sat in our garage for 4 years unopened and untouched. 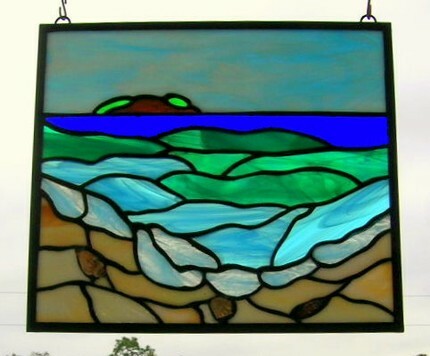 One evening while surfing I happened across a stained glass piece and thought it was cool thinking hey I could do this! Beth added yes you could it’s all out there waiting for you! So over the next week I’d research and then go dig through boxes to see what did this and that and did I have it; I had it all. 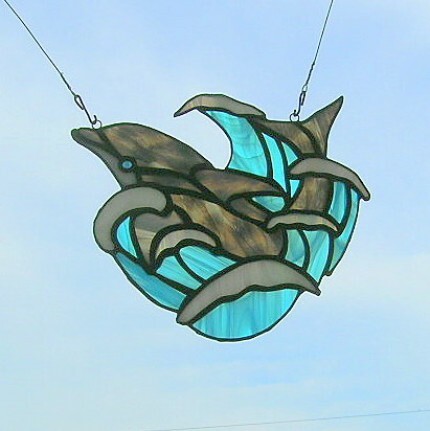 I began cutting glass at night and learning all I could about this craft. Beth and I are self taught through books, internet resources, and our supplier’s knowledge. That was over 5 years ago. After my management position was downsized I decided I had had enough of corporate America. I wanted to concentrate on my art full time. Beth was/is working and we can do this if sales bring in just enough. So being unemployed I had lots of time and began the Etsy shop where we transact all online sales and it grew from there! 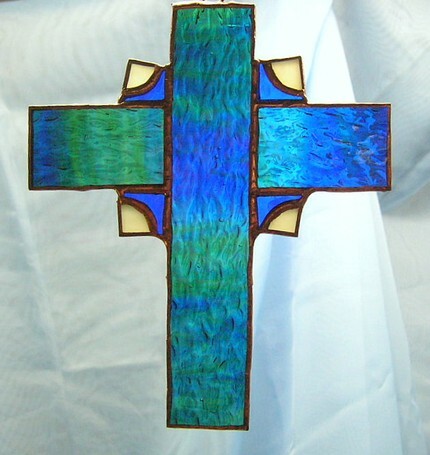 I enjoy designing the piece, working with the client, and cutting the glass and soldering it. Beth enjoys cutting glass, foiling the glass, soldering and final treatments like patinas and waxing the pieces. Beth also enjoys promoting the work as much as I do. I am more active on Twitter and Etsy where Beth concentrates on the Facebook accounts. Our most recent creation of stained glass wind chimes was Beth’s idea. She suggested and I procrastinated and finally folded. Now we always offer them in the Etsy shop. Many people buy more than one. It is wonderful to create something and see it succeed! We are both very much into customer service and being able to “feel” what the customer is imagining for their special piece. At first we only did what we liked and it did sell. 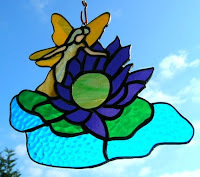 Now we lean more toward wanting to work with people and bring their imagination to life in stained glass. We still create what we want but less often now. There is a certain satisfaction and well a feel good feeling when someone is pleased with what you have designed and created for them. Also a lot of times someone will see a piece and it just hits home somehow and they have to have it and they will explain why. We take the time to listen now and find enjoyment in that interaction. Listening wholeheartedly to the client has added to our success immensely. Marketing to connect with people who will buy pieces. We use Twitter heavily and Facebook too. 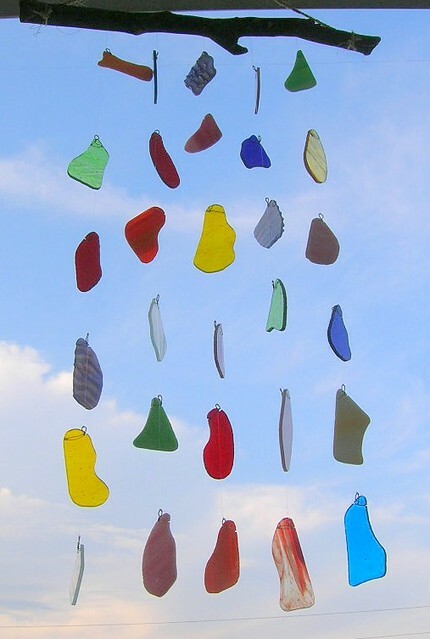 We are now creating our own website and have bought the domain glassofmanycolors.com for ourselves. We have found out everyone; literally everyone, is a potential customer. Additionally our work hangs in a gallery and a beauty shop. Your potential customers really are everywhere but you do need to actively promote to them. Somehow it just came naturally that many colors of this medium just syncs with the coat of many colors and therefore glass of many colors. We did think about it. People do seem to remember the name and it is catchy! It is an immediate association and it seems to being a smile to people’s hearts. We are blessed to be able to do what we love so it all comes together in the name very well. In five years we would simply like to not have to worry about next months income flow as much as we do now. We survive on Beth’s paycheck and the studio income to some extent. It is growing satisfactorily and we have hopes of achieving our goals. 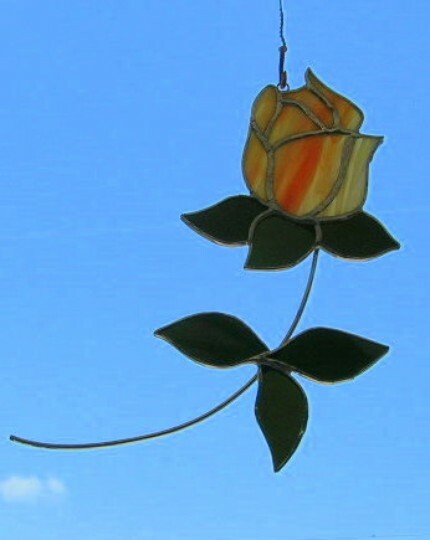 We will still be designing and cutting glass ourselves for our clients. Our business would be more prosperous. Our studio is in our attached garage so we’re home even in business. We work together in the business as much as possible and we do enjoy each other’s talents, skills, and conversation. We’re blessed to be able to have this much time together doing something we both love. Home and business responsibilities just work themselves out and we get it done together. We couldn’t have done this without each other. Beth was on Facebook one morning and out of the blue a guy messages her telling her he sells MaryKay Cosmetics and she probably should look right now at his site and see what she needs. This was in your face now promotion at a near rude level. 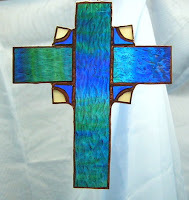 She kept her composure and messaged back to him, “We create beautiful stained glass here is the link to our site see what you’d like to get for someone special.” He purchased two pieces and then afterwards commissioned a custom piece too! He is a wonderful person and a repeat loyal customer. If you listen to your clients and know what they are feeling and why your product fits their need you can respond in a much more heartfelt sincere way. Our customer feedback in our Etsy shop seems to say we listen. Other moments involving memorials for children and loved ones are heart wrenching and yet rewarding once we realized our studio was selected for such an important piece in someone’s life. We try to really put “special” into these pieces. If you have never been in business for yourself you are in for a rude awakening. This is our third self owned business and its still surprises us how many hours we have to put in to really make it go the way we want it to. Enjoy what you do because you will do it all the time for some time to come. Another thing we would add is that you should be honest and ask yourself if you can afford to go into business. You should have nine months minimum savings on the side to survive on until the business gets going. This is in addition to emergency reserves now! You may make money in fits and starts at first so the nine months reserve should last you a year. So many things will come up you will need to spend money on even with a plan, it happens. And here's the fun part! 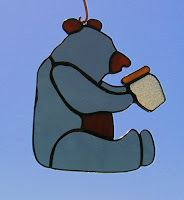 Art and Beth have genereously offered this cute stained glass bear to one of my lucky readers. Here are the ways to receive an entry in the drawing for this cute bear. Be sure to leave your name and e-mail address so we can contact you if you are the winner! You will need to leave a seperate post for each item you do to receive multiple entries in the drawing. This giveaway ends Monday, 7/26. The winner will be contacted through their e-mail address, so please be sure to leave it in one of your posts! 1. Become a follower of this blog (or let me know you already follow). 2. Visit GlassofManyColors Etsy shop and comment on your favorite item here. 3. List your favorite item on Facebook and then post here. 4. List your favorite item on Twitter and then post here. 5. Follow Art and Beth on Facebook and/or Twitter and then post here. Beautiful work by GlassofManyColors! I follow her on twitter, she is a beautiful, talented gal! Lovely to learn more about these fantastic Two Art and Beth! Wonderful interview and beautiful work! 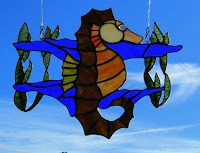 Art and Beth make a fabulous team who produce wonderful stained glass products. It's so much fun to see your listings by following on twitter. Your calm, intelligent approach to business has been beneficial to so many. Combine this with true wit and a zest for life has made it a pleasure to get to know you through etsy and twitter. I am not surprised by your success. I applaud it and can't wait for the next piece..
2. I follow on Twitter. 4. Tweeting the gargoyle now. Thank you to EVERYONE who entered to win the cute honey bear stained glass piece! CONGRATS to Dutch Felt Art! You are the winner!